You don't need to panic when you see the name of this lake in California's eastern Sierras. The last convicts seen in the area were escapees who shot it out with a sheriff's posse in the 1870s. The last we heard, those guys are no longer a risk to visitors. Today, Convict Lake is one of the prettiest lakes in eastern California: 170 acres of clear blue water flanked on three sides by towering granite peaks and ringed with aspen trees that turn golden in fall. As one online reviewer put it: "This place is a postcard waiting to happen." It's accessible any time of year, but receives a lot of snow in winter. That makes it beautiful, but a little harder to get to, and to stay warm once you're there. If you're driving through eastern California, plan your trip with this guide to the area along US 395. The simplest thing to do at Convict Lake is to take the three-mile hike around the shore. That will take an hour or two and is highly recommended during the fall when the aspen trees around the lake turn golden yellow. Not only is it a great way to experience the lake first hand, but it's a hike filled with "Kodak Moments" and beautiful photo opportunities that make great backdrops for family pictures, scenic shots, and even proposals. 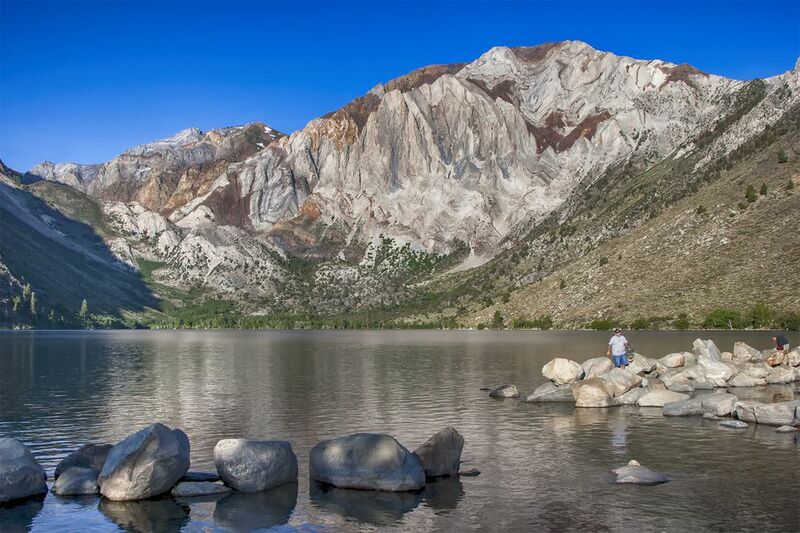 Fishing is the most popular thing to do at Convict Lake. It's stocked weekly with rainbow trout, and nearby Convict Lake Resort offers fishing classes and guided fishing trips. You can also go horseback riding or rent a boat. Whether you want to cast a line or row about the lake, you have plenty of ways to soak up the California sunshine here. You'll also find a lot of wildlife to watch around the lake, including deer, raccoons, and the cutest little ground squirrels who hang out on the rocks at the lake's edge. Families will enjoy going for hikes, learning about local flora and fauna, and simply getting away from their inbox at Convict Lake, California. Even if you've done all there is to do at Convict Lake, rest assured that you'll never be bored east of the Sierras. Mono County, in which Convict Lake is located, is a great destination for a weekend getaway as well. Best of all, it's one of the most affordable places in California to visit so you can extend your outdoor getaway without taxing your budget. Add to your itinerary with my guide to a Mono County weekend getaway. You can visit Convict Lake as a day trip from any of the other area towns between Bridgeport and Bishop, but if you want to stay longer, try Convict Lake Resort. If you're in an RV or are camping in a tent, the Inyo National Forest Convict Lake Campground is just across the road from the Convict Lake Resort. It has 88 sites, pit toilets, and no hookups so self-contained camping is your best option, but no matter what, your setting when Convict Lake camping will always be beautiful. You can reserve your spot there through Reserve California. Convict Lake is at 7,850 feet elevation. Before you go, take a look at our high elevation checklist. It will help keep you well and comfortable. Convict Lake is east of the Sierras, just off US Hwy 395 south of Mammoth Lakes. It's about 30 miles south of the intersection of CA Hwy 140 at Lee Vining and 35 miles north of Bishop. To get there from southern California, take US Hwy 395 north. From northern California, take CA Hwy 140 east through Yosemite National Park. From US Hwy 395 near the Mammoth Airport, follow the signs east toward Convict Lake. The exit is near mile marker 21.50.